In March 2015 Transform!Danmark will, for the fourth year in a row, host an international Transform conference in Copenhagen. The purpose of the conference is to continue the debate on the ecological and equitable alternatives to mainstream economy and thinking. Read about the program and how to register below. 09:30-10:00 Registration and coffee/tea etc. 10:15-11:00 Pablo Solon, Bolivia, Executive Director of Focus on the Global South. Confronting the Root Causes of Climate Change. Why we need to build a global movement to confront capitalism, anthropocentrism and reclaim real democracy to guarantee the rights of humans and Mother Earth. 11:00-11:45 Richard Seymour, Great Britain, Marxist writer and broadcaster, political activist. From austerity to zero growth. Since austerity appears to be an anti-growth policy, the left respond is by bringing to power pro-growth governments. This is a trap. Austerity is a short-term shock; growth remains the religion of capitalism. Tadzio Müller, Germany, Political Scientist, Rosa Luxemburg Foundation climate justice activist. The climate justice- and degrowth-movements are, on many levels, natural allies, seeing as that one has, what the other lacks: a set of strategic targets on the one hand, a social base in the global North on the other. Might their common focus be the fight against fossilistic capitalism? Sukhgerel Dugersuren, Mongolia, Executive Director of Oyu Tolgoi Watch, human rights and environmental defender. On how change in the natural environment due to human activity and resulting climate change can have devastating impact on those dependent; on natural resources and generally large segments of population in poor countries losing access to land and pure water. Jennifer Franco, the Netherlands, Transnational Institute, Co-coordinator of TNI’s Agrarian Justice work. On food sovereignty and agrarian justice versus global land and water grabbing. Boaventura de Sousa Santos, Portugal, Professor of Sociology, University of Coimbra. Learning from the Anti-Imperial South: From Alternative Development to Alternatives to Development. Andreas Karitzis, Greece, Ph.D (Philosophy), Nicos Poulantzas Institute. On developing alternatives to EU neo liberalism and austerity, as seen from the perspective and experience of SYRIZA, the Greek radical left. Linn Stalsberg, Norway, sociologist and writer. Womens liberation in a neo-liberal age. Are we free now? Did capitalism seduce feminism into a dominant relationship? Co-organizers: Afrika Kontakt, Enhedslisten/the Red‐Green Alliance, Grobund (left educational association), NOAH – Friends of the Earth Denmark and the leftwing magazines Det Ny Clarté, Kritisk Debat and Solidaritet. Richard Seymour: “Deres krise – vores løsninger” (translated from “Against Austerity”). Everyone is welcome to stay for the reception! The Transform!Danmark network was founded in 2012 and this is the third international conference organised by the network. Our aim is to contribute to the Danish debate with a critical and informed analysis of the society and create and participate in discussions on alternative development in Denmark as well as Europe and globally. Martin Jespersen er død efter en lang kamp mod kræft. Mange af de aktivister, som deltog ved European Left og transform!europe’s Sommeruniversitet i Porto i juli sidste år, vil sikker huske Martin. Han skrev mange af referaterne fra seminarer, workshops og møder fra Sommeruniversitetet. Han var i alt, hvad han gjorde meget dedikeret og hjælpsom. Han mente, at det europæiske samarbejde på venstrefløjen bør prioriteres højere, og han så transform! som et vigtigt redskab til dette. Martin var også medforfatter af rapporten fra den seneste internationale konference “More Alternatives to Growth” i Transform!Danmark, der blev afholdt i København i marts i år, og han var helt til det sidste et aktivt arbejdende medlem af bestyrelsen, der altid tog sig tid til at reflektere over, hvad der var bedst i en given situation. Martin har været aktiv på den danske venstrefløj siden sin ungdom, og er en meget velkendt og respekteret kammerat blandt et bredt udsnit af danske venstreorienterede aktivister. Han underviste indvandrere i en årrække og var aktiv i at fremme rettighederne for asylansøgere. Han var også medlem af Enhedslisten. Mid September Martin Jespersen, hard-working member of the board of the Transform!Danmark network, died after a long battle against cancer. We are truly sad about this. 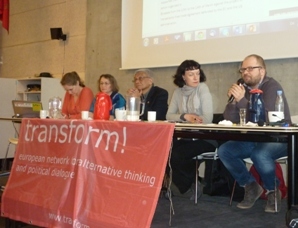 Many activists of the transform!europe network, who participated in the European Left and transform! Summer University in Porto in July last year, may remember him. He wrote many of the transform! reports of the seminars, workshops and meetings of the Summer University. He was very dedicated and helpful – and believed that the European (pan European) cooperation of the radical Left should be upgraded, and he saw transform! as an important key to this. He was the co-writer of the report of the last international conference “Alternatives to Growth” of Transform!Danmark, held in Copenhagen in March this year. However, although he wished to, he was too weak to participate in this year’s Summer University. Martin has been active on the Danish radical Left since his youth and is a very well-known and respected comrade among a broad section of Danish left-wing activists. He taught immigrants for a number of years and was active in promoting the rights of asylum-seekers. He was also a member of Enhedslisten/the Red-Green Alliance. Læs Lance Jensens nekrolog på Modkraft: Martin Jespersen – Den permanente aktivist. Transform!Danmark deltager i dette års Sommeruniversitet, som finder sted 23.-27.juli i Berlin under overskriften Europe – stand up for Peace. Sommeruniversitetet er arrangeret af European Left og transform!europe, og det er i år 9. gang, det finder sted. Siden 2005 er aktivister, medlemmer af politiske partier og medlemmer af sociale bevægelser fra hele Europa samt forskere og internationale gæster fra hele af verden hvert år mødtes for i fællesskab at udvikle idéer til et alternativt Europa.